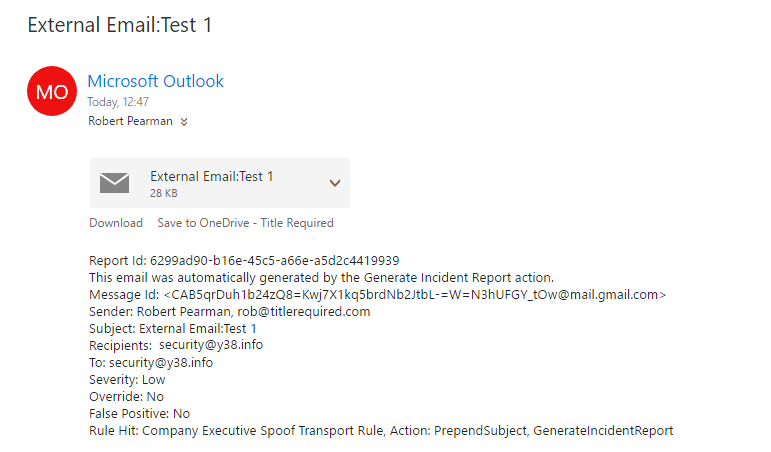 Using Office 365 Transport Rules, this is very easy to implement. In PowerShell we can define our Directors Names. We can also define our Incident Response Content. Next we can create the Rule. Now, when an email is received and the From address matches our Directors Name, our support team will get an incident response, and the recipient will have the subject modified. You might think – well we could just delete them or set the subject to ! !FRAUD FRAUD FRAUD!!! !, however there may be legitimate reasons a recipient gets an email like this with a directors name, and from experience I know people can get quite put out if you start accusing them of fraud. For example, your director may be named John Smith, or he may be emailing his PA from his personal account, we wont go into reasons why. 5 Responses to Spear Phishing: What Can you do? Great idea Robert. Just wondering how would you modify the script for multiple directors? Something like this using a comma separated list? Or put them in an array like the arguments for the incident response.